Nobody should be excluded from being able to learn about computing, or from using it for work or pleasure, by what’s in their pocket. The pricing of electronics means that some important and useful tools have historically been outside the reach of anyone without a large chunk of capital behind them. You’ll have seen the photography hacks we feature here, which use a Pi to make very, very inexpensive versions of photography equipment like time-lapse rigs, gigapixel rigs, water droplet setups and the like. Off-the-shelf versions of equipment like this can cost thousands of pounds, but a Pi and some ingenuity can bring the cost right down to levels which are sensible and affordable. These projects are not just for amateurs: we have seen professional photographers using Pi-based, home-hacked equipment in preference to the expensive stuff. It works just the same, and there’s a lot to be said for the warm glow you get from making your work tools yourself. It’s not just individuals and small businesses who are sometimes priced out of doing worthwhile stuff by the price of electronics. Libraries, museums and other public institutions are often priced out of being able to digitise collections by the prohibitive cost of equipment. Kinograph is an astonishing thesis project from Matthew Epler, an artist and film historian. 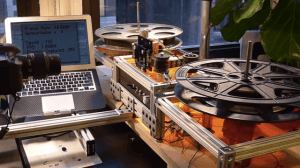 It’s a Pi-powered, open-source, scalable device for digitising old film stock, complete with the ability to stabilise images (another application for OpenCV) and recapture sound. A good DSLR camera is the most expensive part of the setup, at about $2000; the rest of the equipment comes to $1200. (Matthew is working on getting that figure down below the magic $1000.) Compare that to the $480,000 it would cost you to digitise 50 films on reels at a film lab, or the $175,000 it’d cost you to buy a Kinetta (the nearest commercial equivalent device) and a whole world of possibilities opens up. Film stock, be it celluloid, acetate or nitrate based, is not stable, and being able to record and save our film heritage is a pressing concern. We’ve already lost more than 90% of all silent movies, and around 50% of the films with audio made before 1950.